Last night we experienced another session of Composers & the Voice, which consisted of an evening of improv with Terry Greiss from the Irondale Ensemble Project and acting with director Katherine Amshoff. We spent the first two hours with Terry. He had all of us play games that encouraged us to open up and explore the space around us. I find the improv exercises very interesting and a lot of fun, but as Mikah mentioned in an earlier class, what I am most fascinated with is how this applies (or will eventually apply) to our craft as composers and librettists. Sometimes the benefits of these exercises are not explicit, but the more we explore, the more I understand how everything is somehow related. As a composer, I am used to being both a nerd and living a somewhat cloistered life, so these evenings can be a little scary for me, even though I am a pretty experienced performing musician. Acting and performing music are quite different from performing music on stage. However, I am gradually becoming more comfortable, and now looking forward to these workshops every few weeks. 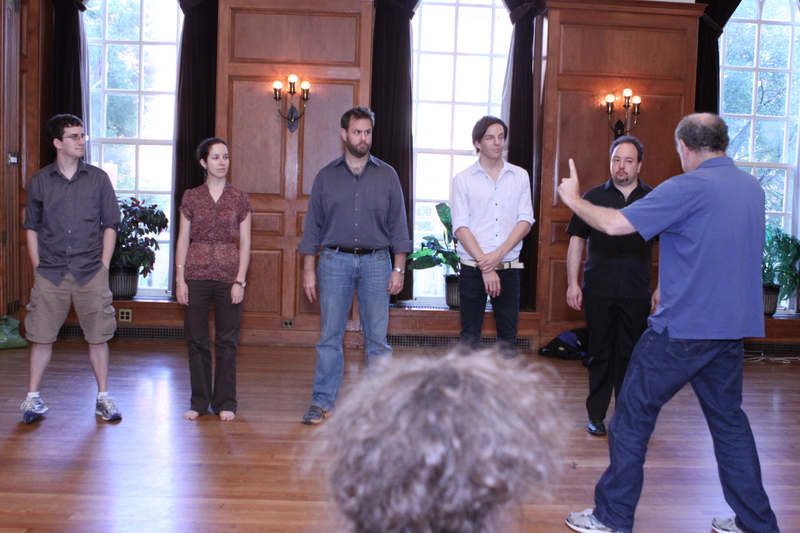 Zach, Mila, Daniel, Mikael, and Rob are gven a new improv exercise by Terry Greiss. Many of Terry’s exercises explore quick interaction and reflexes. One particular exercise he had us do involved standing in a circle and quickly passing around words. There might be one word that you say to the person next to you, and another word that causes you to change direction. A third word might be reserved for saying to the person directly across from you in the circle. Each word triggers a different response. As a composer, what I find interesting is how this particular technique could be used for dramatic effect in a scene, and this whole experience demonstrated how quickly dialogue can move from one person to the next. This will be very useful to know when working with librettists. Kathleen Amshoff’s assignment for the second half of the session was two-fold: first read a chapter from a book on action by Stanislavski, then develop our own three to five minute scene that demonstrated a common task. We witnessed Zach making tuna salad, Rachel folding laundry, Sidney riding the train, Sarah putting in her contacts, Mikah checking Facebook and drinking coffee and Ronnie making scrambled eggs for her child. Preparing food seemed like an easy way to demonstrate movement without much emotion, so my scene was making pancakes and being interrupted by a phone call. As Steve Osgood mentioned earlier, It’s amazing how comfortable everyone seems, especially since we all have such diverse backgrounds. AOP did a great job bring together a wonderful group of people, and I am really looking forward to more improv and hearing everyone’s new work in future sessions. Three cheers for In the Penal Colony, presented by AOP and the String Orchestra of Brooklyn at Saint Ann and the Holy Trinity on October 1st! Bass Matt Boehler and Tenor Jason Papowitz, along with conductor Eli Spindel and director Sam Helfrich, were halfway to the reception hall when they were called back to the stage by prolonged applause for a second curtain call. AOP and SOB’s presentation of Philip Glass’s In the Penal Colony (based on the short story by Franz Kafka) was an evening abuzz with a newfound and zealous appreciation for Glass’s classic opera, not lessened by the fact that it featured a full string orchestra as opposed to the usual string quintet called for in the score. AMERICAN OPERA PROJECTS PRESENTS SCENES AT RUBIN MUSEUM OF ART. JOHN SCHAEFER LEADS PANEL DISCUSSION FEATURING FORMER NUN NGAWANG SANGDROL. New York, NY– On Wednesday, November 16, at 7:00pm, American Opera Projects, in association with the Rubin Museum of Art, will present scenes from Numinous City, a new multimedia opera by British composer Pete M. Wyer based on the extraordinary true story of Tibetan nun Ngawang Sangdrol. The evening will also feature Ms. Sangdrol as part of an artist panel discussion, moderated by John Schaefer (WYNC’s Soundcheck). In addition, Ms. Sangdrol will lead an intimate guided tour of the Rubin Museum’s collection of Himalayan art. Soprano Sara Heaton stars with music direction by Mark Shapiro. The event will be held at the Rubin Museum of Art. Tickets are $18-$45, available at http://www.rmanyc.org/numinouscity. Numinous City is inspired by the true story of Ngawang Sangdrol, a Tibetan nun imprisoned at 14 years-old. Sangdrol, along with other nuns, recorded songs in prison on a smuggled cassette player, the fame of which ultimately led to her release and immigration to Brooklyn, New York. The title ‘Numinous City’ is a reference to the unseen forces, spiritual, emotional and political, that influence her paths. Ngawang Sangdrol was 14-years old when she was detained in 1992 and imprisoned for peacefully demonstrating against the Chinese occupation of Tibet. In Drapchi prison she continued to peacefully advocate for her beliefs while her sentence extensions mounted: her term spiked from an initial 3-year sentence to a combined sentence of 23 years—a result of sentence extensions within prison. She remained an irrepressible champion of human rights and non-violence in spite of the daunting obstacles she faced. In 1994, Ngawang Sangdrol and 13 other nuns clandestinely recorded songs and poems in tribute to their homeland and His Holiness the Dalai Lama from inside Drapchi prison. The recording made it out of Tibet and the international community heard the haunting songs tell of the hardships of prison life and the women’s undying cry for freedom. The international attention to this material led to her release in 2002. The Rubin Museum of Art provides an immersive environment for the exploration of Himalayan art and culture and its connections to contemporary life and ideas through innovative exhibitions, dynamic programs, and diverse educational opportunities. The only museum in the U.S. dedicated to Himalayan art, the museum holds one of the world’s most important collections of the paintings and sculptures of Tibet, Nepal, Mongolia, and Bhutan, and provides a bridge between the cultures of the region and other cultures worldwide. In addition to exhibitions, the Rubin’s programming encompasses dialogues, films, performances, and more, offering multiple entry-points for understanding and enjoying the art of the Himalayas. The shop and café at the Rubin are also inspired by the varied cultures of the region, completing the visitors’ experience. For more information, including hours and location, visit www.rmanyc.org. We had decided to have lunch at P.J. Clarke’s near Lincoln Center. I had, after being so instructed by Tobias, printed a few copies of a synopsis to an opera that I’m writing with my friend David Flodén. The name of the opera is Decoration. I had already started my first aria assignment for AOP, but Tobias insisted on a synopsis in order to be able to assess the aria’s potential as part of an opera. The days leading up to the lunch, David and I worked a lot on our strange story. It will most likely take another couple of years before the synopsis is complete and the libretto in the can, but the key elements are coming together now. We have already taken a few years to get to where we are, and there are plenty of holes to patch, cosmic phenomena to research, mythologies to build and nurse outfits to fashion before the first high C floats off the Decoration stage. That said, the first Decoration aria – Internal – is already in the hands of Rebecca Ringle (mezzo soprano) and Kelly Horsted (pianist and AOP co-music director) for workshopping in November. VERY excited. The sum of all this is that I had to present a rather unfinished version of a rather abstract story (it has a concrete storyline but that storyline takes a few good turns into the fantastical) to Tobias Picker, Steven Osgood and [AOP Managing Director] Bob Lee for feedback. Yes, I do. I have been Tobias’ assistant since the production of An American Tragedy at The Met in 2005. How did that happen then? A tech savvy and good friend of mine was unable to do some midi tech work for Tobias back in 2005 while he (my friend) was traveling, so I stepped in and went to Tobias’ apartment in Manhattan to meet him. He was very friendly and funny and asked me what I do. I told him that I was just about to get my master degree in composition. He then said that he’d like to hear some of what I’ve written, so when I got back home I sent some pieces to him to listen to (I was lucky to already have some great recordings of early stuff, recorded by some astonishing musician friends). Upon my second visit to his apartment for follow-up work, he told me that he had listened to what I had sent, and laid on me some very lovely things about my music. He then asked me whether I would want to be his assistant, since he needed one now that his workload had become so great that he had better focus on only the composing as much as possible. Needless to say, I said yes yes yes. It’s been a great six years so far. I have learned a lot from him, I have grown familiar with more of his wonderful, rich, complex and very honest (this is so key to my taste) music and how he thinks about the compositional process. I have seen a huge opera come to life (two more coming up shortly) and I have seen a praised and very famous composer deal with what it means to truly be in music. I have seen the vast amount of legwork and office task stuff involved in commissions and production work. I have had a steady job (granting me the crucial O1 Visa that allowed me to stay after I graduated) and a dear friend from it. He has been very generous with his time when I’ve asked for feedback. It’s a privilege to get to bounce ideas off someone trustworthy, open-minded and experienced. That’s why saying our hellos didn’t make much sense in 2011. I sit down with Bob and Steven and a minute later Tobias shows up. I hand out the synopsis to see if anyone has any feedback to give, and I am asked by Tobias to tell the core story in “25 words or less”. A few thousand words later, the tangled, mangled and twisted version of the story I had managed to convey was being discussed with a lot of energy and sincerity. Why this? What about that? How do you make that fit with this? I’ve never seen this kind of detail work without this way of presenting it and so on. It was a lot to process, but I got some really good ideas to bring back to David to address the questions the lunch participants had had and see how we feel about them. The best advice is usually that which can be generally applied. That way the advice is not changing the intended destination of what you’re trying to do but rather giving you the map of getting there faster. I received a good handful or two of really important things to keep in mind that David and I had not addressed. Halfway through the lunch, J. D. McClatchy dropped by (to meet with Tobias) so Tobias, in his typically playful manner, dropped the challenge of explaining the story to McClatchy (who has written countless libretti, including that for Tobias Picker’s hugely successful opera Emmeline) on me once more. I think I shaved a few hundred words off the “25 words or less” presentation, but strings still spaghetti-ed untied all around us when I finished. McClatchy listened intently and introduced the matter of abstract concepts in narrative storytelling to our discourse, and recommended the last and unfinished story of Nabokov, which deals with a man who erases himself, for some pointers on how to and how not to go about such a venture. As the lunch drew to an end, I thanked all for taking time out of their ridiculously cluttered schedules to do this. It’s so very New York to me to be in situations like this, where accomplished, and unusual persons who certainly do not have to be helpful still choose to be because it’s in their nature. In 2000, when I first moved here from Sweden to study composition at the Aaron Copland School of Music at Queens College, I was assigned a mentor by the college to make sure that I felt welcome and at home. Her name is Maxine Fisher, and she did this mentoring for no pay. She introduced me to a lot of fun music and to Passover with her family! She was a stranger to me, but she made me feel so incredibly welcome. I once asked her why it is that New Yorkers, who are rumored to be so rude and cold, keep being so friendly and helpful all the time. She explained it this way: In New York, if someone does you a favor, they don’t expect a favor back from you. They expect you to do someone else a favor. I truly believe that without that pay-it-forward attitude in its inhabitants, the New York new music scene would consist of one rich lady in a room with a string quartet playing Philip Glass music around the clock for her only. There is so much art that needs nursing to expand our communal experience of music. The amazing roster of Composer Chairs for this year’s Composers & the Voice is testament to that that attitude isn’t going away anytime soon. After goodbyes were said, my tummy, the poor Waldorf Salad inside it, and myself walked happily down 8th Ave in the Indian summer sun. This was the first session in which each of us shared our role analysis. Basically we each selected a role that AOP singers had identified as one that they had performed/sung or anticipate as one that they should know for their voice type. Our selection was purposefully based upon the voice type for which we had written our first song (also due that same day). In our discussion, we each commented upon various aspects of each role, such as absolute range, general tessitura, deployment of the voice in the opera, appearance of the character in the opera, etc. By the end of our third and final role analysis we’ll have gathered a lot of information with regard to the vocal writing for these operatic characters. I anticipate that I’ll be turning to these notes as I write my next songs. There were two points of somewhat more extended discussion. The first was that of scansion. This issue came up in the vocal writing of Stravinsky, particularly in The Rake’s Progress. He and Sara observed that Stravinsky generally did not pay attention to the scansion of the text. This then led to the question of “Why would a composer not observe proper scansion?” We* speculated that perhaps a composer would do so for a specific effect or perhaps simply to be contrarian (following Stravinsky). I am most certainly curious to hear from our readers. 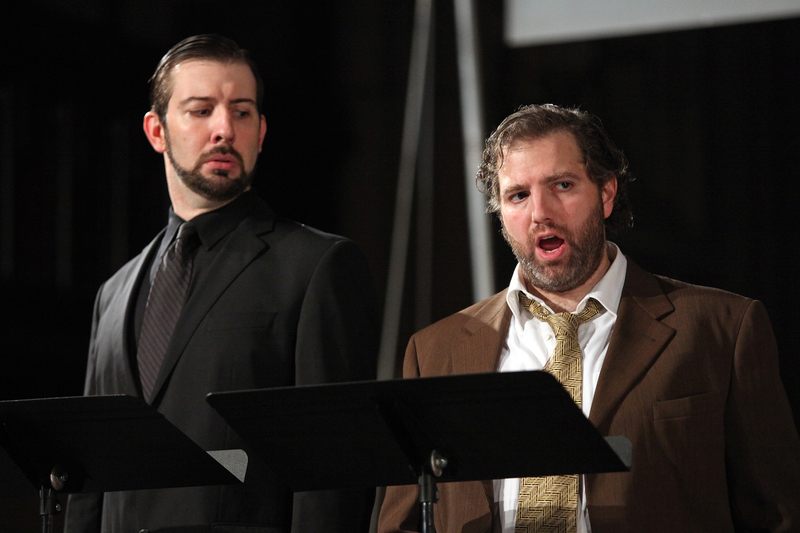 The other point of discussion was the paucity of coloratura writing in contemporary opera. We noted that most of the AOP singers are very solid in coloratura technique—but how can we take advantage of this strength if this is not part of contemporary practice? Will such an aria sound outdated? This depends on the character singing the coloratura aria. In brief, if there is enough dramatic reason for the character to have such an aria, then why not? There and then we all pledged to write one coloratura aria. Ok, that last bit I completely made up, but it would be an interesting challenge. As an aside, I note that in popular music, melismatic singing is rather common. Heck, I don’t think a contestant can win American Idol or X-Factor without throwing in 3-5 melismas at some point during their performance. Our role analysis presentations/discussion was followed by Improv 3, in which we learned that we should not only always say yes but also in fact add something extra, building upon each offer. Responding in the negative immediately limits one’s options for improvisation. Me: Let’s make breakfast for Mom. As my second aside, I note that in non-improv scenarios (i.e., the rest of my life), I am actually trying to learn how to say no—or at least, to say “Let me get back to you on that.” Needless to say, I did rather poorly in this exercise, but I am eternally hopeful, if not helpless. You: Let’s make breakfast for Mom. Me: (After a pause) Let me get back to you on that. We did a few more exercises, including warm-ups. We started with “Zip Zap Zop”, but we were doing this so well that Terry decided to add an extra layer of difficulty. We could now replace any of the three original syllables with any word from the following phrases, but only in the order they appear: “Martin Luther King” and “Kentucky Fried Chicken”. So “Zip Zap Zop” can come out as “Kentucky Luther Zop” or “Martin Zap King” or “Zip Fried Zop”. And yes, you guessed it: I was one of the first to mess up. I am finding that I have a talent for finding my weaknesses in these improv sessions. My fellow AOP fellows can all recount such moments, I’m sure—but of course, all in good spirit. One of our last exercises involved creating and filling an imaginary space with imaginary objects then improvising a fully acted (partner) scene in this space while—yes, you know by now that there would be an added layer of difficulty—keeping two goals in mind. Firstly, both actors had to touch all the objects in the defined imaginary space. Secondly, neither actor could ask questions. Terry: You are making breakfast in your kitchen. ** You are a married couple about to divorce but still living together. Go! I will not go through the dialogue (I use this term loosely) that Ronnie and I improvised (also loosely used)—and by the way, this is the second time that she and I have ended up playing a couple! Are the Improv Gods trying to tell us something? Are we the next Lucy and Ricky? Not at the rate we were going. I found myself breaking character numerous times to comment upon the difficulty of the challenge or beginning to ask questions that then magically transform into demands, which interestingly was appropriate for the scene. In the moment, I heard her say this but I was so caught up in making sure that I didn’t ask any questions and that I hadn’t yet touched the window or the door (I’m fairly certain I touched everything else)—her comment registered, but my brain didn’t process it as something to which I could respond. Terry pointed out (after the scene) that this had so much potential for development of further dialogue between two people about to get a divorce. Methinks I have much to learn. *The use of the plural here does not imply a collective pronoun, but rather reflects my faulty memory—I can’t exactly remember who said this!!! **This was the imaginary space that we had decided upon as a group, with a stove, a fridge, a sink (on an island, no less), a window, a door, a coffee maker, a hutch, and a countertop—all items that we had to touch with reason during the course of the scene. In an apparent attempt to make us the happiest composers and librettists on earth, AOP has paired all of us with a mentor for our Composers & the Voice fellowship. Zach and I were paired with Stephen Schwartz, and, on Wednesday this very 5th of October, we (along with Steve and Charles) were lucky enough to have lunch with him. Now, I should probably mention that Zach and I come from a musical theatre background. We also, oddly, both have Important Early Performing Arts Memories of Pippin, one of Stephen Schwartz’s early shows (and one of my all-time favorite pieces of theater). Pippin was Zach’s first experience playing in a pit band. And, for me, Pippin was an obsession that lasted for years and which reached its first furtive climax when, at the age of 10, I got into a concert for free at which Ben Vereen (the original Leading Player) KISSED ME ON THE FOREHEAD, forever solidifying my then only vague notion of pursing a life in the performing arts. So we had lunch with Stephen Schwartz. And it was enlightening. Stephen gave us some invaluable advice about the relationship between lyric and music. He told us stories from his own experience. And he answered all the questions we could possibly come up with. We were particularly interested in what Stephen had to say about story in opera as it relates to story in musical theater. Since Stephen places a great deal of importance on storytelling, we were eager to hear what he had to say on the subject. He talked at length about the differences (or, more accurately, the similarities) between opera and musical theater. We were struck by his ability to connect the abstract ideas involved in writing to the very concrete details of his own career; this, perhaps, was the most valuable thing of all. Steve and Charles helped to moderate the conversation, which made it not only enjoyable but also interestingly academic. They asked some great questions that Zach and I (secretly quite starstruck) would never have come up with. It was also very cool to see the relationship that has developed there, after having, together, put up Stephen’s opera. Stephen also spoke briefly about the very specific challenges of being a successful writer. With Godspell and Wicked on Broadway and other large-scale productions around the world, Stephen has to find the time to actually write. 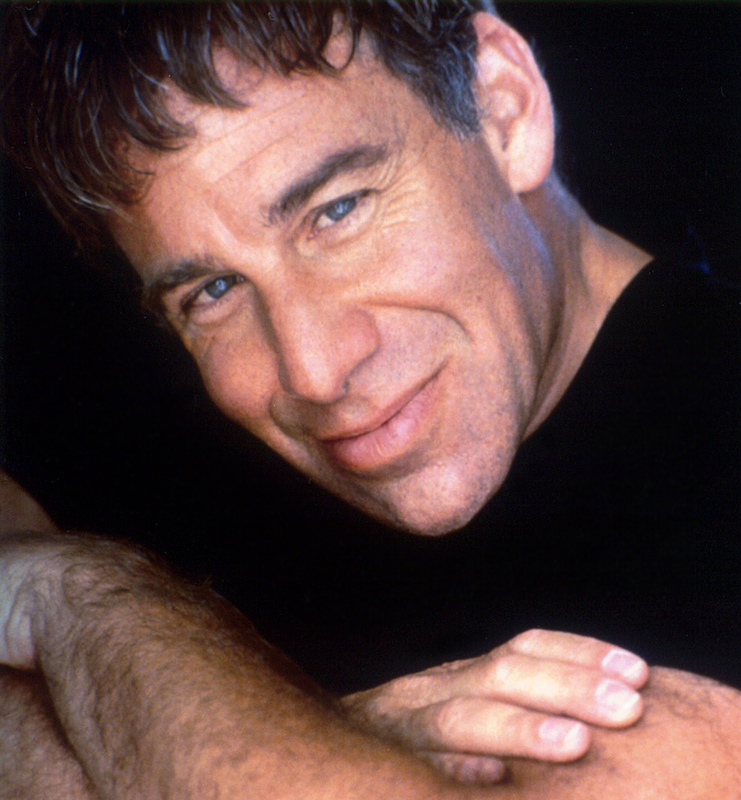 This was very inspiring to us as early-career writers; it is always challenging to balance life and work, even for Stephen Schwartz. Anything is possible. A truly wonderful experience. Thanks to all. In honor of the MODEL LOVE premiere this evening, a playlist for your listening pleasure: eight songs that loosely line-up with their counterparts in our song cycle to help get you in the mood. (Parental Advisory: Some songs contain explicit lyrics… but then again, so does MODEL LOVE.) Enjoy! You are currently browsing the Have a Voice blog archives for October, 2011.